With the municipal elections happening in less than a week, lampposts all across the country have once again come to display a colourful mix of political posters. Now, normally, I would hardly pay them any attention, but since my mother is standing for Councillor in the area I grew up in and has a few posters of her own scattered around… well, I’ve kind of started taking a bit of an interest. This new-found poster-spotting hobby also came in handy the other day when Marieke had to take photos of these latest street decorations for work. She asked me if I’d seen any in our neighbourhood, as she had not spotted a single one. Well, let’s just say I could basically draw her a very detailed map of where she would find which posters… okay, not quite, but you get the gist! 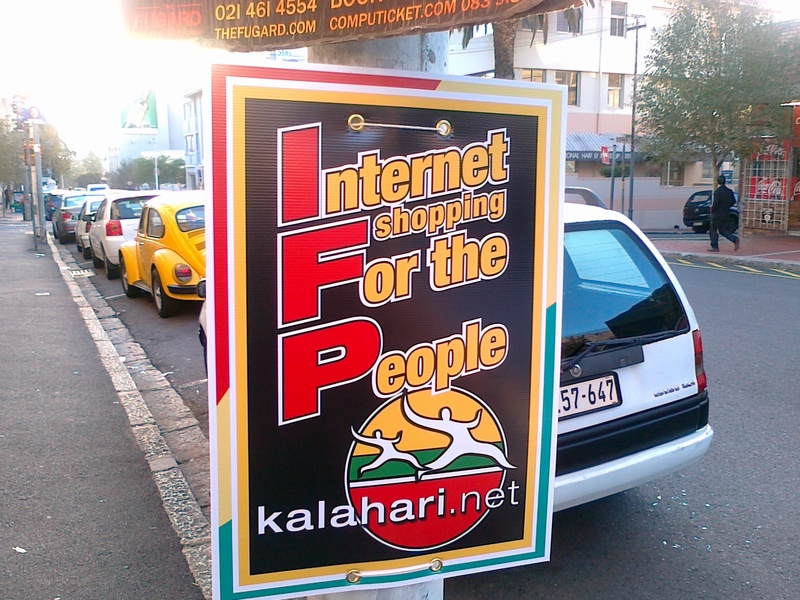 “Internet shopping For the People.” Huh? Say whaaaat?! Okay, blame it on the early morning and the fact that I was still on my way to get a Deluxe coffee, but it took me a good few seconds to figure out what was going on! So, Kalahari.net has embraced this period of badly designed posters to put together some advertising of their own. Very clever I think, but, not sure how effective. I spent the rest of my walk looking for others, but couldn’t spot any. So, if you’ve seen any, take a pic and send it my way so I can load it into this post to keep good old IFP company! Hahahaha! Damn Between 10 and 5 for being so much more on the ball than Gypsified! Damn them to hell!